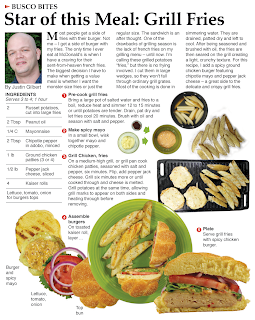 I started out creating this recipe with the intention of featuring a gourmet burger. It was in creating a side of potatoes to go along with the burger that the focus became the "grill fries." It took me a while to get them right – tender and fluffy on the inside with a crispy outside. I used a technique employed by many restaurants that make their own french fries. To get the inside and the outside right, the potatoes are cooked twice: pre-cooked to make the inside tender and then cooked again, after a resting period, at a much hotter temperature to get the outside crispy. All of this usually done in a fryer. For this recipe, the first cook of the potatoes is done with boiling, the second with grilling. The potatoes were so much work that I simplified the sandwich and focused on the fries, which are, coincidentally, my favorite food. If I was stranded on a desert island and I had a choice of food to survive on, it would definitely be french fries -- no ketchup needed! As I just mentioned, french fries are my favorite food. Always have been. The side of burger with my fries theme has always been a joke of mine when eating out and I was glad I was able to share that philosophy in the introduction. 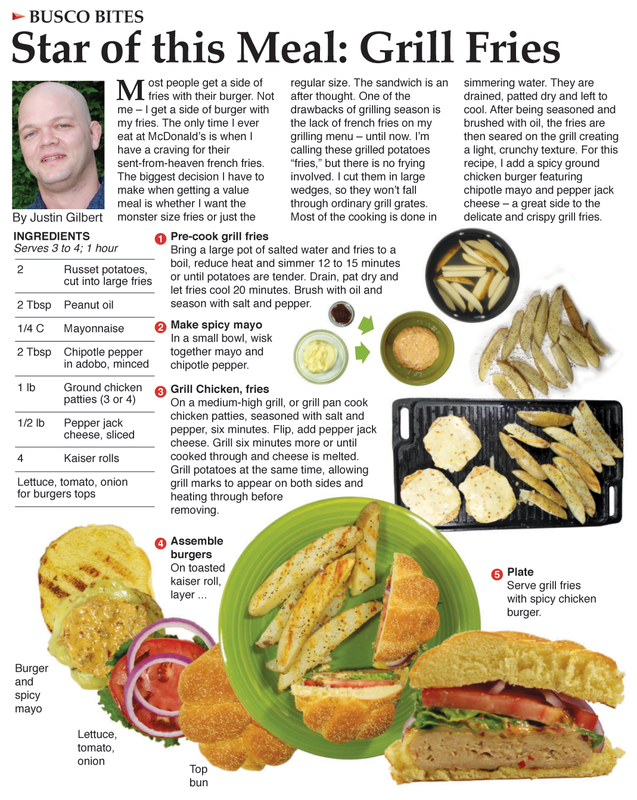 Also, it's fitting for this recipe because the fries were more work than the chicken burger, which is nothing out of the ordinary except for the chipotle mayo and pepper jack cheese to give it a spicy kick. In the "layer the burger" step I tried something different from my past "build a sandwich" technique. I photograph layers individually, creating a fan of the entire sandwich. Notice the difference in how I layered the shrimp wrap in this recipe vs how I have layered the chicken burger. I had a lot of fun writing the introduction of this one. It's a window into my often wacky thoughts about food. And it's a great way of creating crispy potatoes on the grill. It was the fulfillment of a culinary quest to bring my favorite food into the backyard barbecue without the use of a fryer! All content, images and graphics by Justin Gilbert. Simple theme. Powered by Blogger.